North Atlantic Books, 9781583945551, 320pp. 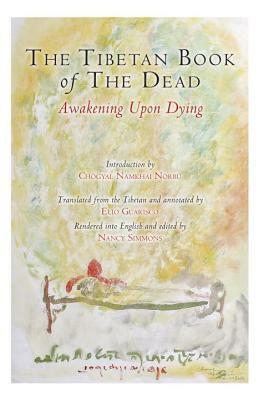 The Tibetan Book of the Dead: Awakening Upon Dying, with introductory commentary by Dzogchen Buddhist master Chögyal Namkhai Norbu, is a new translation of the ancient text also known as The Great Liberation through Hearing in the Intermediate State. Both a practical guide and intriguing historical, cultural, and spiritual document, this new version incorporates recent discoveries that have allowed for a better translation of previously ambiguous passages. Revealing a set of instructions designed to facilitate the inner liberation of the dead or dying person, the book provides a guide to navigating the bardo--the interval between death and rebirth. Originally composed by Padmasambhava, an important Indian master of the eighth century, the Tibetan Book of the Dead was concealed in Tibet until it was discovered in the fourteenth century by Karma Lingpa, a famous Tibetan tertön (discoverer of ancient texts). Describing in detail the characteristics and fantastic visions of each stage beyond death, the book includes invocations to be read aloud to the dying person, to help his or her successful journey toward the stage of liberation. Chögyal Namkhai Norbu's introduction clarifies the texts from the Dzogchen point of view and provides a scholarly summary of the ancient material based on his oral teachings and written works. In addition, material from several of Namkhai Norbu's more recent written works and oral teachers have been added, including an essay on the four intermediate states after death entitled Birth, Life, and Death. A full-color 16-page insert of traditional Tibetan art highlights Tibet's unique aesthetic wisdom. Padmasambhava was a Tibetan master from the eighth century who introduced the Buddhist teachings to Tibet. He is considered the author of several sacred texts that were hidden and rediscovered several centuries later by accomplished practitioners called tertons (discoverers of ancient texts). A famous Tibetan terton from the fourteenth century, Karma Lingpa was a meditation master who discovered the ancient texts of the Tibetan Book of the Dead that had been hidden centuries before by Padmasambhava. Born in Eastern Tibet in 1938, Chögyal Namkhai Norbu is an internationally known Dzogchen Buddhist teacher and author. He is the founder of two nonprofit organizations including the Shang Shung Institute for Tibetan Studies, which is dedicated to the preservation of Tibetan culture. Elio Guarisco received a Master of Arts degree in Italy before traveling to India to study Buddhism. He joined the Dzogchen Community in 1986 and is a founding member of the Shang Shung Institute for Tibetan Studies. "This is a new inspired translation of a famed classic of Tibetan literature presented in the traditional context of the teachings of the Great Perfection (Dzogchen), which will provide practitioners precise and genuine guidance in the various Bardo states that one faces at the end of one's life. I truly admire the style and the fluidity of the rendering of the original texts. This is surely going to become an invaluable reference for all practitioners!" "Known as The Great Liberation through Hearing in Tibetan, this book is a manual of instructions to guide the dying person on the difficult path at the moment of death and the deceased person in the bewildering post-mortem state, as he or she wanders in confused search for a new life. The reader first needs to awaken to the awareness that death is an ineluctable part of life. If we truly know that, our life beomes more meaningful, so that we can face death when it knocks on our door and we are prepared to use that crucial time for self-realization."